Three prior forays into the New England Fights cage demanded all of five minutes and nine seconds from Zac Richard. 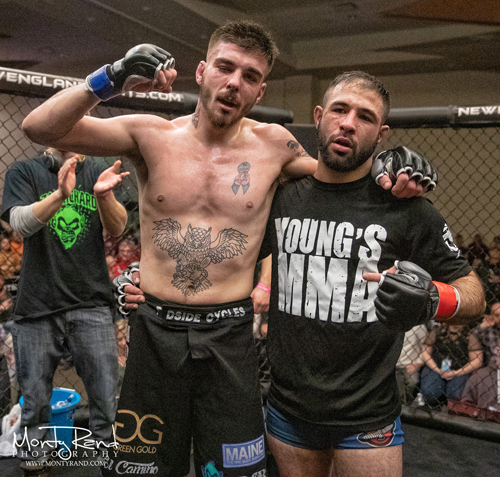 That was the aggregate time it took for the native of Waterboro, Maine, to accumulate three wins by knockout or submission and earn a shot at the vacant NEF amateur featherweight title at NEF 37 on Friday, February 1. Richard probably only now fully appreciates how the odds were stacked against him that frosty evening. He was paired with Fred Lear, a veteran of eight previous fights who won the bantamweight belt in his previous outing. Both Lear’s home and training center sit a stone’s throw away from the Cross Insurance Center, scene of the showdown. While draws are a rare turn of events in mixed martial arts, and ties are universally maligned as an unsatisfying outcome to any sporting endeavor, Richard can appreciate the judges’ indecision after the first true donnybrook of his budding career. Richard, a Maine state wrestling champion in high school, has worked on the finer points of his stand-up game with UFC veteran Devin Powell and other instructors at Nostos MMA in Somersworth, New Hampshire. Pride and practicality persuaded Richard to engage in slug-it-out tactics with Lear, but old habits die hard. Lear’s assault to the body admittedly took a physical toll on Richard. The newcomer obviously never experienced such blunt trauma in his pre-MMA combat days and hadn’t been touched in his career-opening win streak against Gabriel Diaz, Clifford Redman and Chris Lachcik. Even sitting on the stool in his corner between rounds was surreal. Of course there were thoughts of Richard’s sister, Lacy, who lost her battle with cancer in 2012 but continues to inspire Zac with her fighting spirit. Having time to get in touch with one’s thoughts and survey the scenery aren’t the norm when you’re finishing opponents before the echo of the opening bell fades. When it became obvious Lear wasn’t ripe to be knocked out, Richard tried to balance self-defense while keeping the scorecards in mind. “Going into the fourth and fifth round, I knew I was tired, and I knew Fred could punch and kick just as well,” he said. “I was thinking to myself, ‘You’ve got to keep your hands up. This is dangerous when you’re tired.’ All I kept thinking about was don’t get hit. Hit him. Those back-and-forth battles in regional and state mat affairs did serve Richard well. He felt that he was mentally prepared for the championship rounds, even as the physical toll increased. Richard acknowledged that he has a bad habit of training without using his mouth guard and that it may have affected his breathing in the bout. While unhappy with the draw, Richard takes encouragement from many details that have come to light in the aftermath of the fight. The mixed result surely entitled Richard to an immediate rematch. That won’t explicitly happen, as Lear informed him that he intends to turn professional. That future will include another crack at the belt, on April 27th.